Appeared in Wisconsin Architect in 1990. This project was designed and built before either the Americans with Disabilities Act (ADA) or mandatory Uniform Federal Accessibility Standards (UFAS) design guidelines were in place. 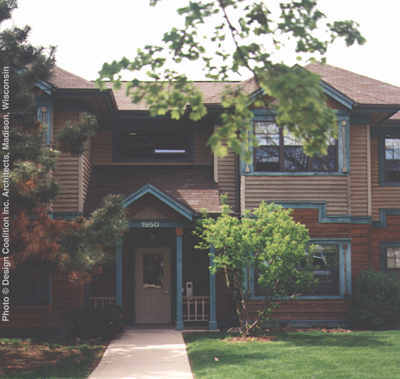 Madison Mutual Housing Association no longer exists, but The Avenue Cooperative remains a very desirable, affordable and accessible place to live. The Avenue Cooperative provided a unique opportunity for Design Coalition architects. 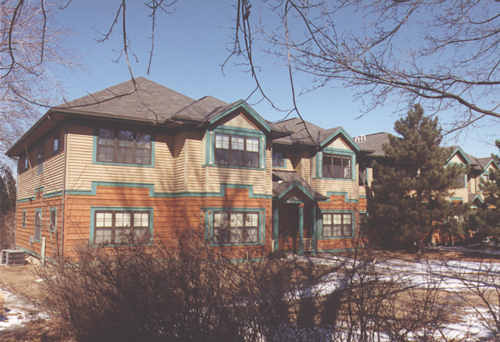 In mid 1988, the University of Wisconsin decided to sell an underutilized building complex on Madison's east side. The architects worked with Madison Mutual Housing association to prepare a successful proposal to compete with developers for the site. Both are non-profit organizations known for their commitment to finding ways to achieve quality, affordable housing. Neither before had tackled a project this large. 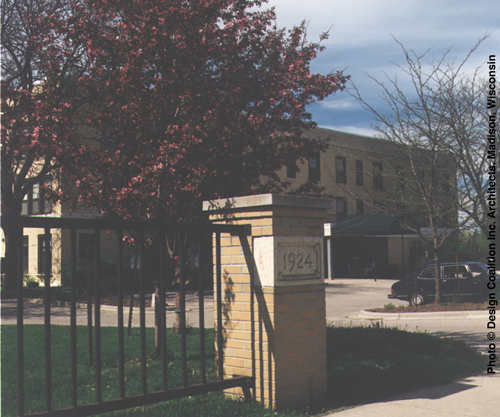 The owner, a non-profit housing developer with 200 other units throughout Madison, blends the strong Midwestern tradition of cooperatives with the successful model of mutual housing associations that continue to flourish in Europe. For this project it intended to develop 40 apartments as a resident-managed, "intergenerational" cooperative. The project would provide affordable, quality living for a mix of people: young professionals, families, older professionals, families, older adults, and people in need of physically accessible housing. "Affordable" was defined in this case to mean housing and utility costs that do not exceed 30% of household income, with rents substantially lower than Madison median. To meet that goal, costs would have to be strictly controlled. Krupp Construction of Madison was selected immediately after the preliminary design phase and built the project on the budget. Arnold and Sheridan provided consulting engineering services. Other requirements were equally demanding: Design the grounds and all the buildings to be completely barrier-free and do it in a way that isn't noticeable. Incorporate special design features for the mobility, hearing and visually impaired into some units. Preserve all possible trees and green space but park 64 cars on the surface. Also, very important, with Wisconsin Power and Light Holding Company as a primary sponsor, create energy efficient buildings and systems. And design it and complete construction in just over a year to take advantage of tax credits. Finally, address the skepticism--- even open hostility ---of some neighbors to the nature of the project and its residents. This effort required months of building trust, and succeeded by giving the critics a role in decision-making. The recent success of the same owner-architect team's Reservoir Cooperative (also built despite initial hostility, but subsequent strong support of its neighborhood) was helpful in this effort. A neighborhood advisory committee met throughout the preliminary design phase and actually became advocates of the project to their neighbors. The project site of 2.56 acres is located on the Madison east side and is a former hospital, a solid ---though not especially handsome-- yellow brick building with it's adjacent boiler building and a post-war prefab structure. The ground include numerous mature trees and has long functioned as a neighborhood park. However, the complex was built originally as a contagious disease facility and most recently used as a detox center. As a result, the site had a strong negative image to overcome. Old time residents recalled the prevailing habit of crossing the street to avoid the place. A major design challenge was simply to make the complex perceivable as a place to live. The original hospital and boiler buildings (A and B) were gutted to make way for 32 units. 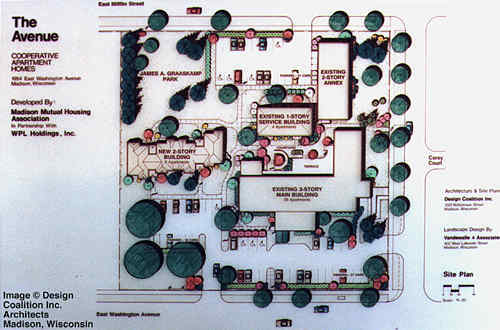 Building A (floor plan below) has large laundry rooms with plentiful windows located at circulation nodes, a community room with kitchen and several bicycle storage rooms. (Madison has two bicycles for every automobile). Original balconies are retained; a new hip roof at Building B links it visually to Building C. The loading dock area between the three buildings was created as a landscaped courtyard, incorporating a raised terrace and ramps. Eight units (Building C, below), heavily insulated wood frame, scaled and articulated to recall the surrounding two-unit dwellings. This structure zig-zags slightly to enclose the courtyard and preserve three well-grown conifers. With generously sized units intended mainly for families, kitchen/dining areas are oriented to provide a view of the playground. The entry commons, with laundry, also functions as space for house meetings. Conventional wisdom would have called for demolition of this structure, in only fair condition, to make way for more housing. It was spared, however, because its two tenants are agencies that provide support services to the disabled in Madison. Improvements were limited to minor repairs and new chillers. Madison historically attracts a large percentage of Dane County's population with disabilities due to the availability of social services, medical facilities and attendants. It is estimated that as many as 10% of the country's residents require some accessible housing modifications, and such well designed housing is in short supply. The Avenue has six units designed as "barrier-free" for people with physical disabilities and scattered throughout the complex. Indeed, the owner elected to refuse a HUD subsidy because it would have limited barrier-free units to one floor for the main building and effectively "ghettoized" those with mobility impairments. In addition to these six, 12 more units are designed to be relatively easily adapted in the future. Meetings with a review committee of service providers and individuals with various disabilities were invaluable to help make the difficult tradeoffs and to fine tune unit design and detailing. A few examples: special kitchen and bath cabinetry; receptacles wired to the central alarm system to alert the hearing-impaired with-fans or strobes; powered main entry doors, operable from any unit or in the future by hand-held radio transmitters (similar to the ones that trigger garage door openers); site-built roll-in showers, oversized to accommodate attendants; and carpet wainscoting to prevent damage by wheelchairs. Mounting heights were scheduled so all equipment will be reachable, from light switches to the turn screws on the furnace filter grilles. Occasionally such agonizing attention to detail was humorous in hindsight; after examining the drawings of blocking carefully positioned to allow flexibility of grab bar placement, the contractor in some locations simply installed plywood to entire walls. Even the "conventional" units have many barrier-free design elements, which tends to make the "special" features elsewhere unremarkable and smooths the way for friends or babysitters with disabilities. All units received new windows with low-emissivity glazing, humidistat-controlled exhaust fans and individual high efficiency furnace for maximum user control. Great care was taken with vapor barriers, especially at the original masonry walls, to avoid the brick deterioration that can accompany insulating walls not intended for insulation. Approximately 1/4 acre, designed by the architect and wheelchair accessible to foster play between children of all ages with a full range of physical abilities. Included are paved paths, underground tunnel, wheelchair accessible picnic tables, sand play area, swings and hill slides. Still to come are raised planters with flowers and aromatic herbs. A winter sledding slope, identified by neighborhood children during the designing of the site, is preserved. All but three existing trees were retained, and substantial plantings added. Other textural and olfactory cues were also incorporated into the site design and plantings to enrich and ease wayfinding for those with visual impairments. In a quiet area of the site, grouped as if in conversation, reposes a five-piece sculpture by artist Michael Burns, entitled "Content". It depicts pure forms emerging from rough metal and stone and honors University of Wisconsin Professor James A. Graaskamp, a nationally known real estate and development expert and outspoken local advocate for better land use planning. A wheelchair user himself, Graaskamp had once remarked, "It isn't the package, it's the contents. The strength of this project is that it achieves so many worthy objectives within one project; it comes remarkably close to being "all things to all people". 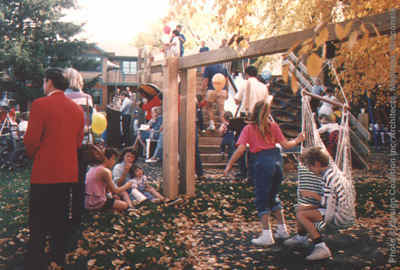 It successfully reconciles a demanding program with a modest budget ($1.8 million, including playground and site work). In the best sense: no one is left out.